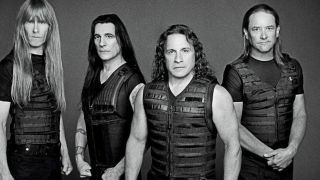 Manowar have announced they will split after an upcoming farewell tour. Date and venues for The Final Battle tour have not yet been revealed, but it will begin in Germany, the band say in a statement. The New York metal heroes say their most recent trek – the Gods And Kings world tour – was a groundbreaking moment in their career and they aim to go out on a high. Manowar say: “Message To All Manowarriors. The Gods And Kings tour was a groundbreaking moment in our career. The stage, sound, video and you, our fans, were magnificent. “Coming off such an amazing tour it was clear that the next time we must go even bigger and beyond anything we have ever done – something that will fulfil every Manowarrior’s dreams. Manowar continue: “Those who join this tour will be left with an eternal memory, having witnessed the band that has dedicated their blood, hearts, souls and every moment of their career to true heavy metal. Manowar’s most recent studio effort was 2014’s re-recording of their 1988 album Kings Of Metal.